When starting the game, the main menu wil appear. RESTORE: Select this option to restore a previously saved game. 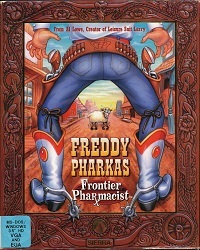 PROLOGUE: click this option to watch the prologue to the game (the Ballad of Freddy Pharkas). When the prologue ends, the player will automatically start Act 1 of the game. PLAY: click this option to start playing from the beginning of Act 1, skipping the game prologue. HELP: provides (no-longer valid) information on customer service, sales,technical support, warranty information and such. Walk icon: Click on the first icon or right-click the mouse for the mouse pointer to change into a walk icon. Then click on a location on the screen to walk there. In some screens in the game where you can't walk around (such as close-up screens), this is replaced by an "exit" icon. Click the exit icon to return to the regular game screen. Eye icon: Click on the second icon or right-click the mouse for the mouse pointer to change into an eye icon. Then click on a location on the screen to observe objects, people and so on, often with funny comments. Fast-forward icon: During longer cut scenes, this icon becomes available. Click it to skip the cut scene and go right back to the action if you like. Beware though - cut scenes often contains clues. Current item icon: in the small window, right of the taste icon, is the inventory item which is currently selected. click it or right-click the mouse for the cursor to change into the inventory item and click it anywhere on the screen to use it on a person or item. When no inventory item is selected, this window will be blanked out. Score: displays your current score out of a possible 999 points. In this window, you can look at, activate or select inventory items. To select an inventory item, click the select icon (the arrow icon), then click on the desired inventory item and then click "OK" to return to the game screen. The selected inventory item will be displayed in the menu bar. Note that you can also combine inventory items in the inventory screen. If you have many inventory items, they may not all fit in the window. If so, the "more" button becomes available. Click it to see more inventory items. In the control panel, you can save, restore, restart or quit the game. You can also change various settings, such as the detail (though that make no difference when playing in DOSBox), game speed and music volume. By clicking on the HalfDome icon, you see the game credits.